The woman was among several pedestrians struck by a car on Westminster Bridge, before it crashed into railings. 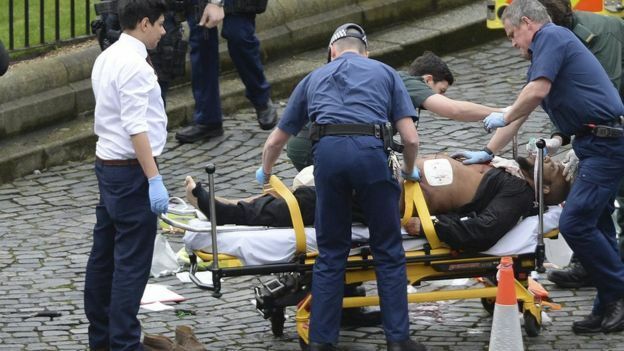 An officer was stabbed in the Houses of Parliament by an attacker, who was shot by police. 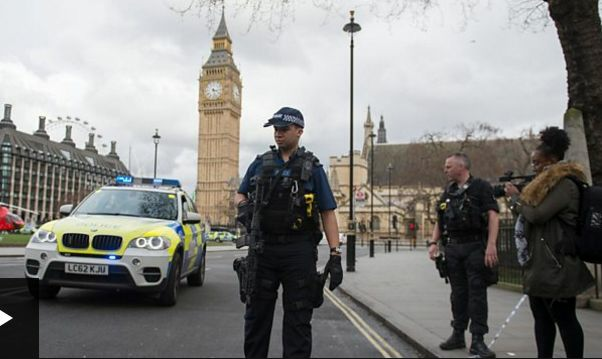 According to the BBC, police said there were "a number of casualties" and a "full counter-terrorism inquiry" was under way. One woman died and at least 10 others were wounded when a grey Hyundai i40 mowed down several people on the Westminster Bridge before crashing into the gates outside Parliament, according to The Telegraph. The French Prime Minister Bernard Cazeneuve said French school pupils were among the injured and offered "solidarity with our British friends, and full support" for the wounded students and their families. Prime Minister Theresa M. May is to chair a meeting of the government's emergency Cobra committee later. There are also British diplomats working in the British Overseas Territories, including in the Virgin Islands where Governnor John S. Duncan OBE represents the Queen, however, it is not clear whether the diplomats have been put on safety alert. Meanwhile, according to information obtained by our newsroom most of the Virgin Islands students studying in London are safe and accounted for. I can sympathize with the Brits. Of course no one should die from walking on the sidewalk. These things are so unfortunate to occur around the world when members of parliament talking piss. People could get angry mehson. It's probably a race card or violation why this angry Chinese causing chaos at the UK Parliament. This is a tragedy for Britain and the world. Please don't make it worse by tweeting about it, Donald Trump. Our prayers are with the injured and their families. We must stand with the people of Britain and our other allies, and do a better job of understanding the world situations. Demonizing an entire religion will not make us safer. Hiding in fear and building walls only makes us more, not less, vulnerable. My heart goes out to the families and friends in the UK--such a tragedy. have to love VINO, bringing the news as it unfold from everywhere. Keep up the good work vino. Keep lighting up the dark. The BVI stand with the Londoners at this tragic hour. Like Trump provoked 9/11 and every other terrorist attack since 1990, right? Many of 'them" want to kill or convert all Christians no matter what Trump, Bush, or anyone else does. You can go ahead and lay down and expose you neck if you want to, maybe that will make them peaceful people and just maybe they will just cut off your head anyway. "Meanwhile, according to information obtained by our newsroom MOST of the Virgin Islands students studying in London are safe and accounted for." Exactly how many are NOT safe and/ or accounted for? I've been to Westminster Bridge and will return again one day. If the attacker's aim was to terrorize both Londoners and visitors like me, he failed miserably, and so will anyone else who tries to copy him. Prayers for the deceased and injured, who only wanted to go about their business on an ordinary Wednesday.